KoreaTravelEasy was involved for the 2018 Seoul-Tourism Industry Startup new 8 companies SHOWCASE! 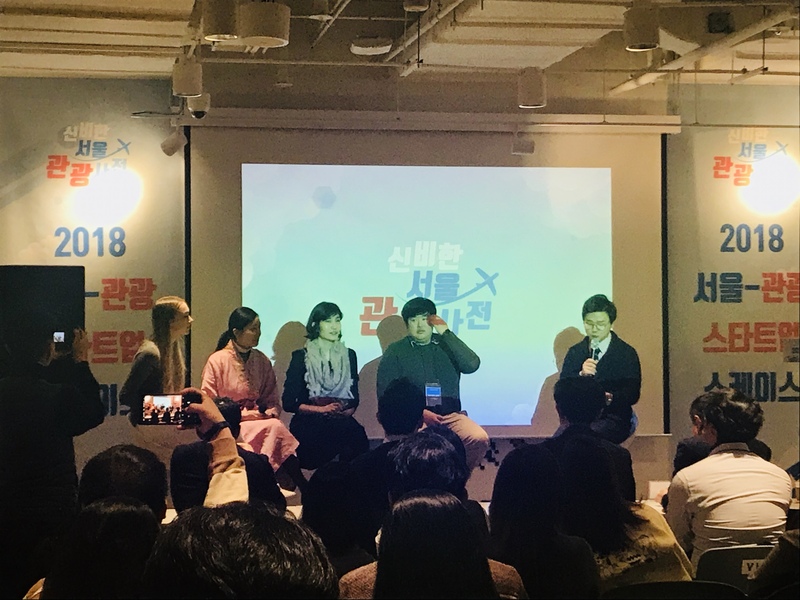 With the Seoul Metropolitan Government and Seoul Tourism Organization have held the “2018 Seoul Tourism Industry Startup SHOWCASE” at the WeWork Seoul Station Branch from 3 PM to 6 PM on Dec. 6th. This SHOWCASE is for 8 new startup companies which picked up from Seoul Tourism Organization and they have organized experience movies, Demoday, Marketing Booth and Events. KoreaTravelEasy was one of the picked up companies and have presented the result of the companies’ achievements for this year! 서울시와 서울관광재단이 개최하는 「2018 서울-관광스타트업 쇼케이스」가 6일(목) 오후 3시부터 서울역에 위치한 WeWork에서 열린다. 쇼케이스 개최 장소를 후원한 ‘WeWork’는 사무공간과 아이디어를 공유하는 스타트업의 상징공간으로, 전 세계 58개 도시에 248개 지점을 보유하고 있다. 이는 지난 4월, 치열한 경쟁을 뚫고 공개 오디션을 통해 선정된 8개 관광스타트업의 최종 결과물을 공유하고, 프로젝트의 사업화를 응원하고자 마련된 자리이다. 서울시와 서울관광재단은 2016년부터 ‘서울-관광스타트업 협력 프로젝트’ 공모전을 통해 정보기술(IT) 및 콘텐츠 기반의 스타트업을 발굴하고, 지원해오고 있다. 이번에 개발된 프로젝트는 향후 평가를 통해 최대 2년간 서울시 및 서울관광재단의 채널을 활용해 홍보 및 판로개척까지 통합 지원받을 수 있다. 일본의 모모코는 이동식 한복체험트럭인 <한복남>과 서울 전통시장 요리여행인 <오미>의 프로젝트를 체험하고 촬영한 영상을 공유한다. 프랑스의 봉쥬르헬로는 장애인을 위한 무장애 관광코스를 소개하는 <모아스토리>와 MICE용 호텔 공동예약 서비스인 <팬텀글로벌>, 전문댄서에게 K-POP 안무를 배워보는 <rkd엔터테인먼트>서비스를 체험하고 경험담을 공유한다. KoreaTravelEasy Information on Traditional Korean Food Cooking Class and Local Market Tour in Seoul!